ITM camera crew in Tokyo, Japan. Tokyo, July 2015: When renowned filmmaker and animator, Hayao Miyazaki criticised his government's plans to allow Japanese armed forces to play a greater role overseas, an ITM camera crew was there to exclusively film the event. 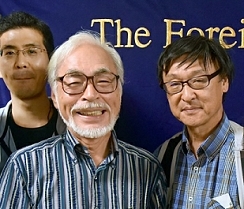 Oscar-winner Miyazaki was speaking in Tokyo on July 13th at a meeting hosted by the Foreign Corresponents' Club of Japan which was streamed live over the internet. Material shot by ITM was distributed not only to foreign broadcasters and international news agencies but also to the major Japanese broadcasters. 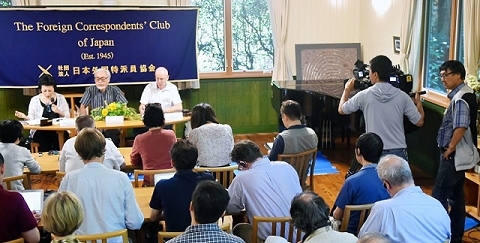 Hayao Miyazaki's press conference in Tokyo.